Make a lasting impression with your new master bedroom! The master bedroom is refuge within your refuge, an oasis from kids’ toys, teenagers’ heaps of laundry, and piles of junk mail. It’s a peaceful place where you can bathe and dress uninterrupted at day’s start. It’s where you can get away for a book or a nap on lazy weekends. And it’s where you’ll want to relax, unwind, and sleep peacefully at day’s end. If you’re thinking about creating master bedroom for your home, remember that you don’t necessarily need to build out. It may be possible to build up over a garage or porch, to fold in space from a neighboring room, or to simply convert unfinished space. When you work with Frey, we will help you brainstorm what’s feasible and best suited to your needs and home. Generally speaking, master bedrooms are not the place to sink money if you’re trying to flip a home for a profit. But if you plan to stay in your home for even just a few years, it’s an absolutely worthwhile investment. Peace, serenity, sanity, and a good night’s sleep are priceless. Treat yourself to that luxury master-bedroom oasis you’ve always wanted! Backed by an A+ Better Business Bureau rating, over 20 years of service, and a 15-year workmanship warranty, we will help you imagine and create the master bedroom of your dreams—or bring your own inspired vision to life. Request your no-obligation consultation today! 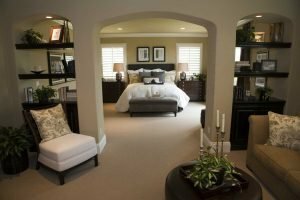 First-floor master bedrooms are becoming increasing popular as people think about “aging in place” and concerns about being able to navigate stairs later in life. According to the 2014 version of the Cost vs. Value report issued annually by Remodeler magazine, the average cost of a master bedroom addition has dropped by about $2,500 since 2011-2012. According to the same report, the average cost-value ratio for master bedroom additions has improved by about eight percent during the same time frame. "[We chose to contract with you because] we were impressed when we met Stacey. She listened to what we wanted and offered suggestions we liked. We also had gutters installed and were impressed with the process and follow up Frey Construction. We were impressed with Stacey and her professionalism. Once we picked a design, our project came together quickly. From our project manager, Ben and the excellent craftsmen Frey Construction works with. We are more than pleased with our new..."